Two men have been dramatically arrested by police after fleeing from an allegedly stolen car that crashed into a house in Springvale. 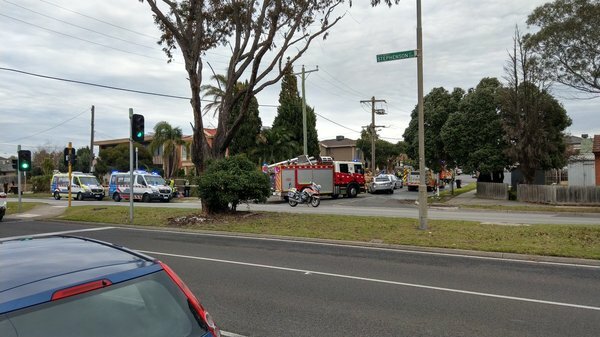 Emergency services were called to the scene at the corner of Springvale Road and Stephenson Street about 12.25pm on 5 July. Police say the Holden Commodore reportedly crossed the Springvale Road median strip before crashing through the property’s fence and becoming stuck between a brick garage and fence. None of the home’s occupants were injured by the crash, police say. An eyewitness and media student Cameron Osterlund, of Springvale, said heavy white smoke issued and the engine revved “on and off” as the driver tried to escape in the entrapped car. “At first I thought it was just a fire and I called triple-0. One of the fire fighters smashed the car window and snatched away the car keys, Mr Osterlund said. It was fortunate no one was injured when the car crossed over the busy road, he said. Two of the men tried to flee over fences when police arrived at the scene. A crowd of people looked on as the pair were chased down on foot and arrested by the officers. One of them attempted to cross through the Springvale Road traffic, Mr Osterlund said. 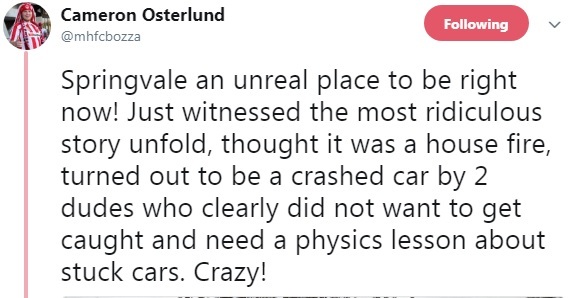 “It was quite entertaining,” Mr Osterlund said of the surreal scene that unfolded. He comprehensively tweeted about the incident, stating: “Seriously never seen a fire truck stop so fast. “I forgot to mention he’s not wearing any pants for some reason, neither of them were when they got out of the car… It’s maybe 12 degrees so clearly something wrong,” was another of his comments. One of the arrested men was to be taken to hospital under police guard with non-life threatening injuries. The other was in custody assisting with enquiries, police say. Any information to Crime Stoppers on 1800 333 000.